Gregor Hannah owner of Lady of the Glen, has picked outstanding casks time and time again, we were delighted to have the chance to sample this 20 year old Tobermory, this was being sold through the Lady of the Glen website for £85.57, however in the few weeks since we received our sample this has already sold out! This says everything about the quality of the whisky from Lady of the Glen. 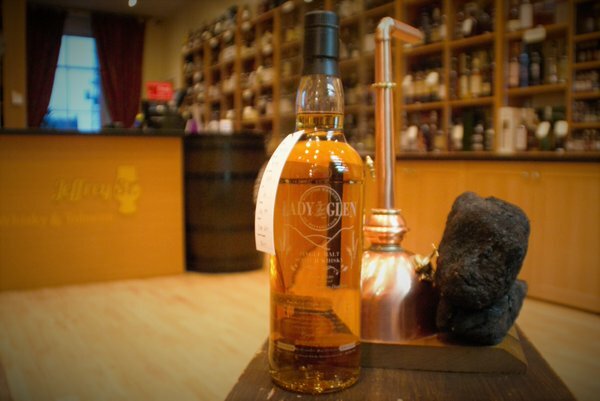 Take a look at the Lady of the Glen website, they still have one or two fabulous bottlings left, but once they are gone, they are gone. I got lucky with this cask as it came through a much more random source! I was slightly apprehensive releasing a Tobermory but after I sampled it I understood that it was a good quality cask and it had been in a good warehouse too judging by the relatively high cask yield for a 20 year old. Originally we were going to release it as a 19 year old but delays in bottling meant that it just ticked over the 20 year mark and we had amended the bottle designs to reflect this. Each bottle is glass etched and uniquely numbered. Having sampled only a few releases from Tobermory I am interested to see what this has to happen, as Gregor has only released exemplary bottlings so far, I have high hopes. Time to find out. Bottled at cask strength of 56.6% distilled in July 1995 and bottled in September 2015. First up tart apples and gooseberries fight it out for the sharpest notes. There’s a creaminess with large amounts of lime juice and zest, it reminds me of an artisan Key Lime Pie. There is a cereal digestive note, with wedges of lime and dusted with icing sugar. There is a hint of highly polished mahogany, and the wet, colour changing leaves of a forest in Autumn. As it opens up there is just a touch of strawberries in balsamic vinegar and black pepper. Lots of wood and wood spice on the palate straight away. There’s drying oak in abundance, mixing with green sapling sticks off an apple tree and balsa wood models. The lime from the nose soon appears and brings with it the apples. This turns this into a fruity, mouth-watering delight. There is a creamy note, which again is so reminiscent of cheesecake, the slightly sour mascarpone mixed with lemon and lime and the butter from the biscuit base. There is an added depth with pecans and walnuts combining with the oak, and a warm chilli tingle. Medium to long, the fruits are first up, again lime, lemon, and this time a touch of very tart rhubarb. There are some baking spices, with both nutmeg and cinnamon pulling through before the oakiness takes over. The nuttiness of crushed walnuts, and strong oak influence really starts to dry this whisky out and leaves a slightly bitter taste, however, the creamy notes return and give this just enough sweetness and stop it from drying out completely. I really wasn’t sure what to expect with this release, generally all the Tobermory’s I have tried have all been fairly old releases, and yet I often overlook the distillery. I really enjoyed this release and it’s easy to see why it sold out so quickly. The slightly sharp, fruity notes are really mouth watering, then the creamy notes combine with the biscuits and butter, with the oakiness coming through and adding a far richer, deeper element. This is perfectly balanced, and if you didn’t manage to try this, you really did miss out. Watch Lady of the Glen closely, they really don’t put a foot wrong, here’s to the next release! A chalkiness mixed with boiled milk, fresh grass followed by a hint of milk chocolate and a touch of peach rounding this nose off. Popping candy to begin with as this dram fizzes all over your tongue. The milk chocolate from the nose seems to have been replaced by a bitter dark chocolate. More bitterness follows and is joined by a hot spice. Dry leaves and broken branches make this quite an arid dram. Quite short, hot with the bitter chocolate remaining. Not what I was expecting for a whisky of advanced years, it’s still quite punchy and hot, though I would say lacking in any fruit flavours. Interesting to try but probably not one that I would buy.